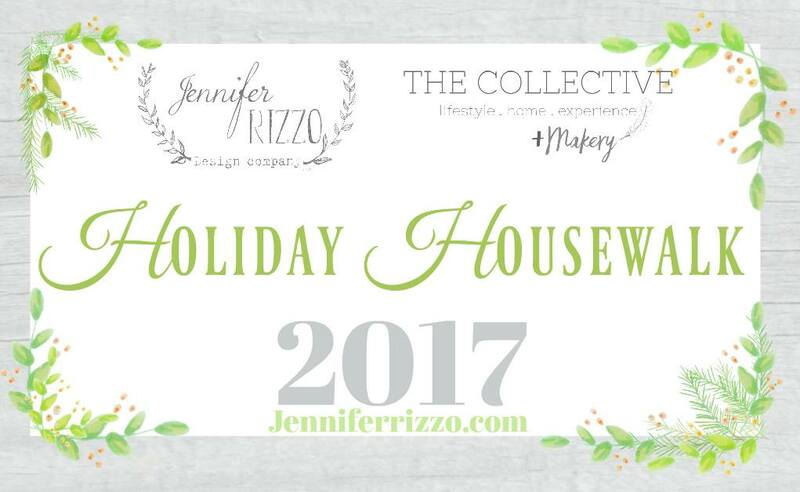 Hey everyone, welcome to the this year’s Holiday Housewalk hosted by Jennifer Rizzo! I’m so excited to be back on the tour after taking last year off while we were building this house. It’s always such a fun tour and everyone on it is amazingly talented. Be sure to start over at Jen’s blog to see all the tour’s from Monday and Tuesday. 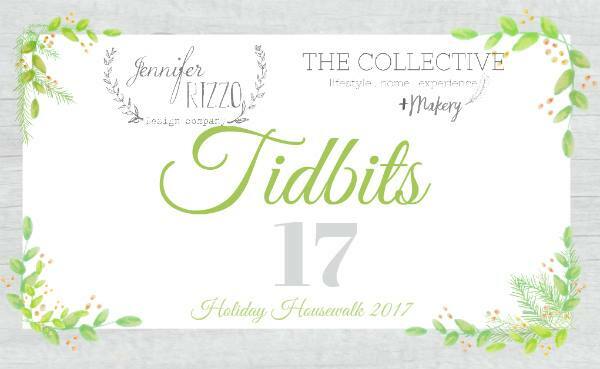 A warm welcome to all of you coming over from Cami at Tidbits today or other stops on the tour. 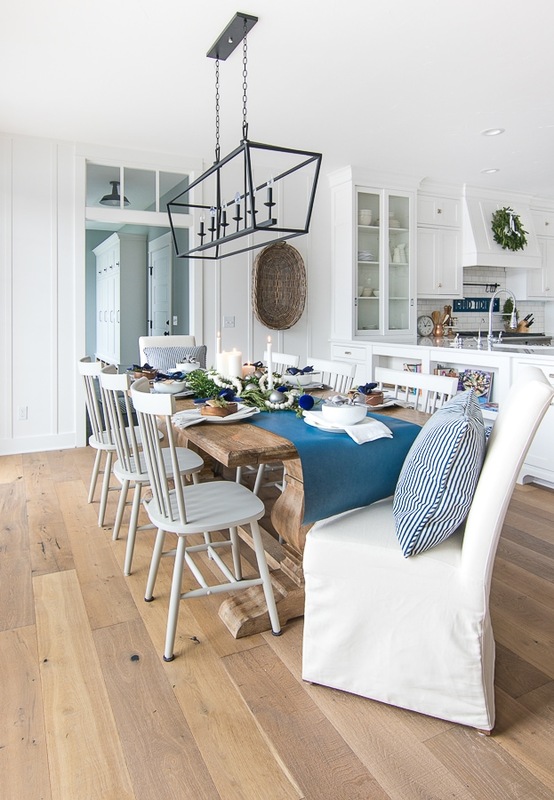 Cami is so talented and her decor looks beautiful – you can see it all here. 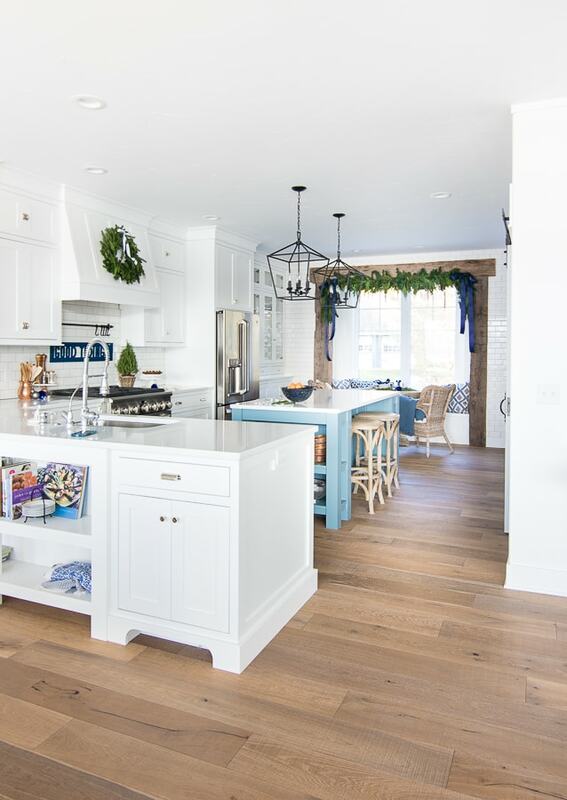 If you are new to The Lily Pad Cottage, we just moved into this house in May, and it was such a fun process to be able to design every detail. It has been equally fun to deck the halls this year. I went with a navy and white coastal design to compliment the lake views outside. This is my favorite room in our house where we hang out all the time. The big windows in here let us look out on the lake (when it’s not pouring rain and snow like it was when I snapped these photos) and it’s so peaceful and cozy with the fireplace on. You can see more details about this room and some tips on the garland in this post here. I found these cool massive light up ornaments at HomeGoods and bonus my kids have big plans to set up a fortune teller booth with them next Halloween ha! Our 9 foot flocked tree looks so pretty lit up in this corner, it only took me moving it 3 times to decide it looked best tucked in here. Our house is very open concept to take advantage of the views, and I’ve been playing around with a tablescape here in the dining area. We are actually hosting Christmas for the first time, so I’ll be sharing more of this tablescape next week. My kids and I have already started the Christmas baking, and I went with a simple wreath and sign in the kitchen. You can see more of our kitchen here. 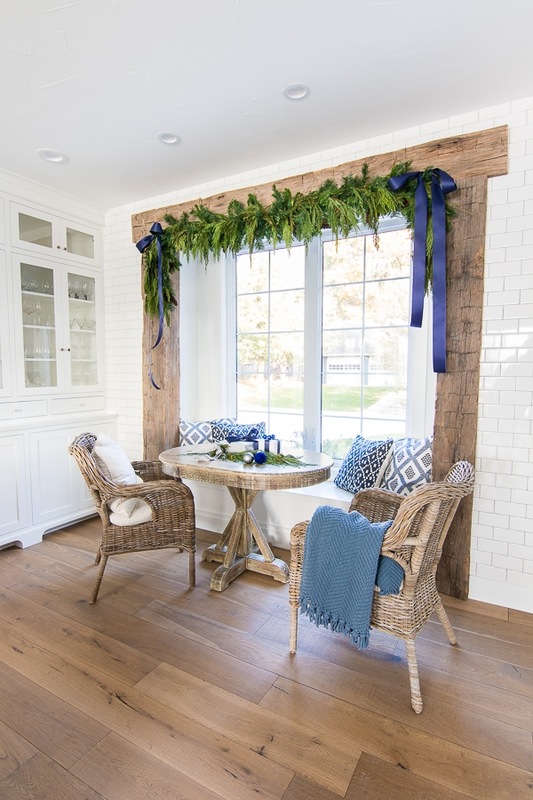 The breakfast nook is a favorite spot to warm up with hot chocolate, and I hung up a simple garland in here as well. You can read more about it here. Thanks so much for taking the tour! I’ll be sharing more Christmas decor for the next few weeks, so I’d love to have you all stop by again. If you have questions about where to find anything in our house you can check out our “shop our home page” here. 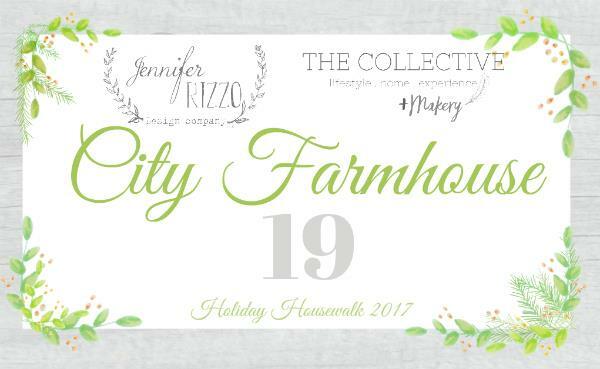 I’m the last stop on the tour today, but be sure to checkout the first stop tomorrow – City Farmhouse. Jen has amazing taste, and I can’t wait to see how she decorated this year! This home tour is stunning. I loved every picture. I wanted to see even more. I will be coming back all of December to see what you will be posting. I loved it!!! Thanks so much Jenn, more coming this week! Beautiful! 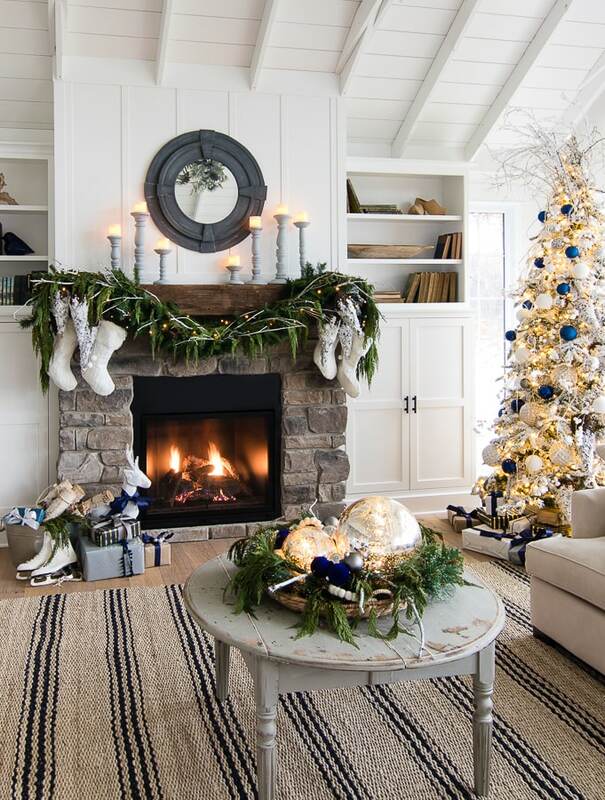 I love the navy and think I will be adding this color to my tree this year. Merry Christmas 🎄. Merry Christmas to you too Beth! Gah! 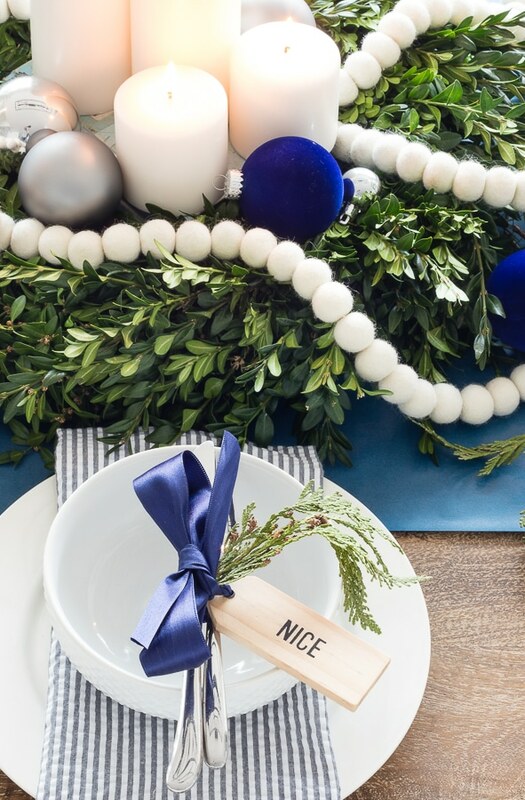 Your dining room table with the flatware all snuggled up in the blue satin ribbon, greens and ‘NICE’ tag is the cutest Christmas place setting I’ve ever seen! Those tags are adorable. Is ‘NAUGHTY’ on the other side? Beautiful home, Kelly! Simply beautiful! Happy Holidays! Gorgeous!! Am a huge fan of the navy!! Love, love, love… the simplistic beauty! I’m obsessed with all of it, Kelly! Your living room is so inviting and cozy. I know we joke about it, but I really do want to come to Michigan and sit in front of that fire. So pretty! Where did you find all your gorgeous navy blue ornaments? I’ve found some blue ones but most everything is a lighter blue which I’m not looking for. Chelsea we are going to get you to Michigan one of these days!!! I found these ones at Michaels, it was hard to find navy this year! Santa is putting you on the nice list for this! 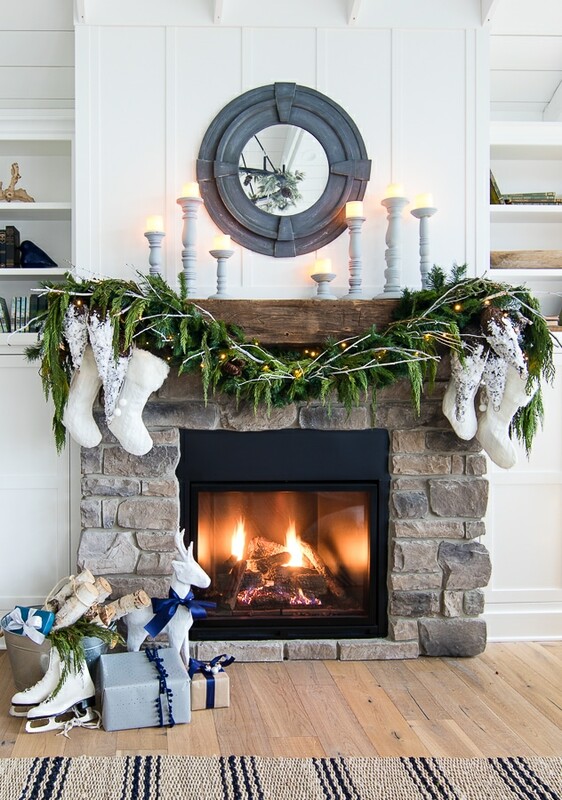 Your home is stunning Kelly – wishing you a Merry Christmas! Thanks Kelly, Merry Christmas to you and your girls! Super cute as usual! 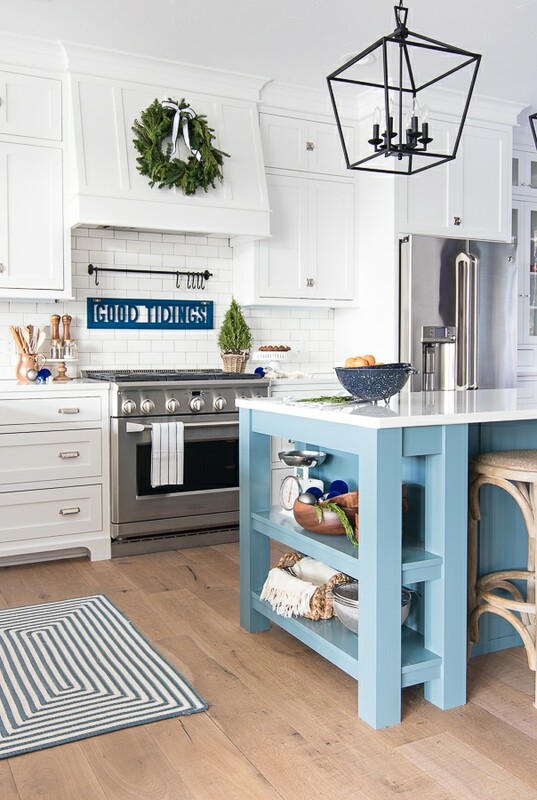 Love the dark blue with silver and white. I was wondering where you found the white garland with the white balls? Would love to get some for my decorating this weekend. I found that at West Elm a few years ago, not sure if they still have it? I’m a Michigander as well. On what lake do you live? We live in the Gun Lake area – thanks! Oh cool!!! I’m in Ada…not to far away!!! Simply stunning!!! You did an awesome job!!! Perfection!! Love, love, love every inch of your new home. I have been trying to get an answer to my question about your window size in the living room, but havent received a response. May I ask the size of your windows (each side) and possible the width of the band of molding inbetween the windows (the large band between the sets)? Please? Hi sorry about the delayed response on the windows I often answer emails and comments in a coffee shop so I’m not at home to measure things. Our windows are 4 ft by 6 1/2 ft with a 9 inch band between thanks. So beautiful. Very classy and elegant. Merry Christmas and thank you for sharing your home! Merry Christmas Cheryl thank you! WOW What a beautiful theme this year.! Very well done! Im sure you are so happy in your new home and for it to be done! 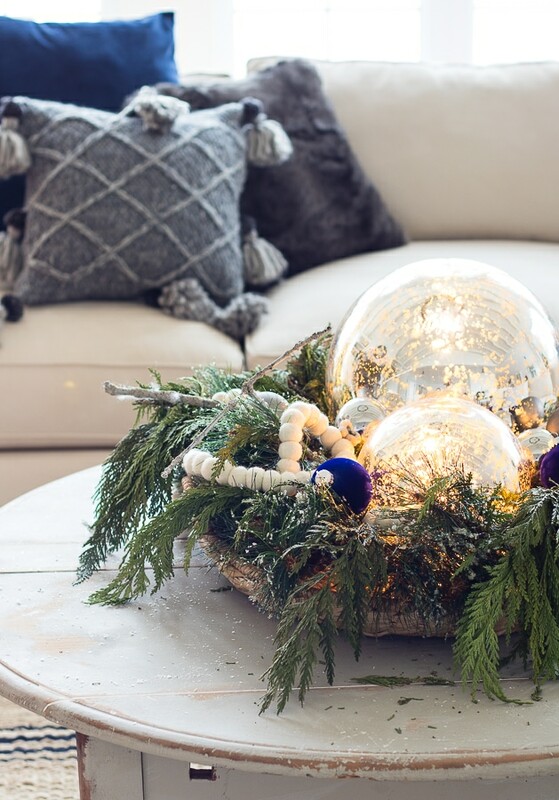 I Love the natural and elegant simplicity of the greens and the light up ornaments. The indian wedding table decor is so beautiful. Very well done. Just gorgeous, The only thing is the last photo you posted, I Would love to see it with the chandelier and dinning room lights on. I bet that would be spectacular! . As a professional photographer I wanted to say you handled the lighting on tree and the candles on the mantel and fire in the fireplace well. I know that wasn’t easy. Always love everything you do! Youre style is so clean, natural, gorgeous, and classy at the same time. Perfection. Thanks Dixie I really appreciate your comments on the photography! This room is particularly hard to shoot in the winter because the sun comes streaming in and we have no window coverings, I struggled so much getting these shots so thanks for the kids words. kelly, i am in LOVE with your home! so so gorgeous- the blues just pop! Love all the blues this year!! Beautiful job friend!! Looks like you are all settled in! Your house is one of my faves. It is so beautiful. The navy makes me want to get rid of all my red! I’m sure I’ll make a return to red again, I still love it! Absolutely stunning! I love all the little details as well as the overall color scheme. This is the type of thing I have zero eye for, and it amazes me when I see a house so well put together. Not to mention clean… holy cow! Thanks so much! And you should see my basement, definitely not clean ha! Absolutely gorgeous! The stick sprouts as a “crazy hair” tree topper is so cute. What size wreaths are ribbon are hanging over the windows? 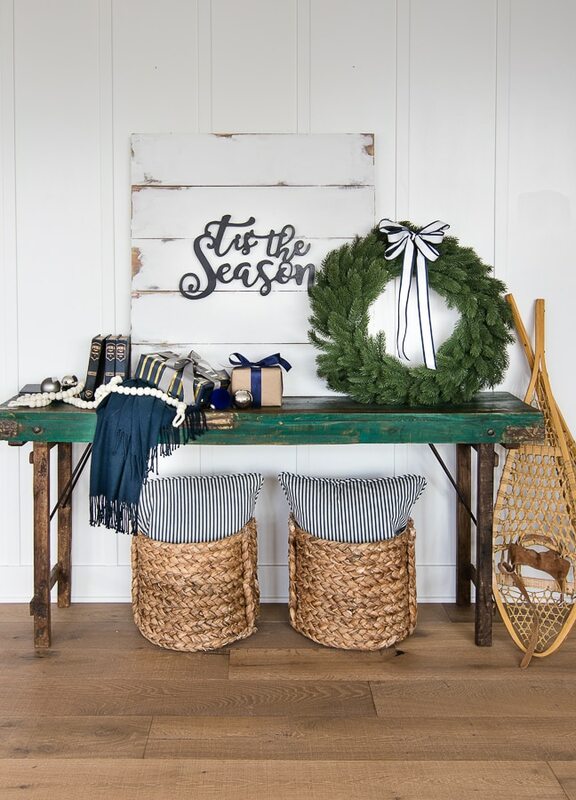 Love all your holiday decor ! Where did you get the large round silver mercury ornaments that you have in the basket on the coffee table? Do they light up? It looks like they are lit in the pictures. I found great silver mercury votives candles this year & the silver ball ornaments would look great with the. Thanks – enjoy the season! Kelly, I do believe your home is my very favorite out of all of the home tours I’ve seen this year! Your touches of navy blue make my blue-loving heart so happy! OH thanks so much Jordan!! 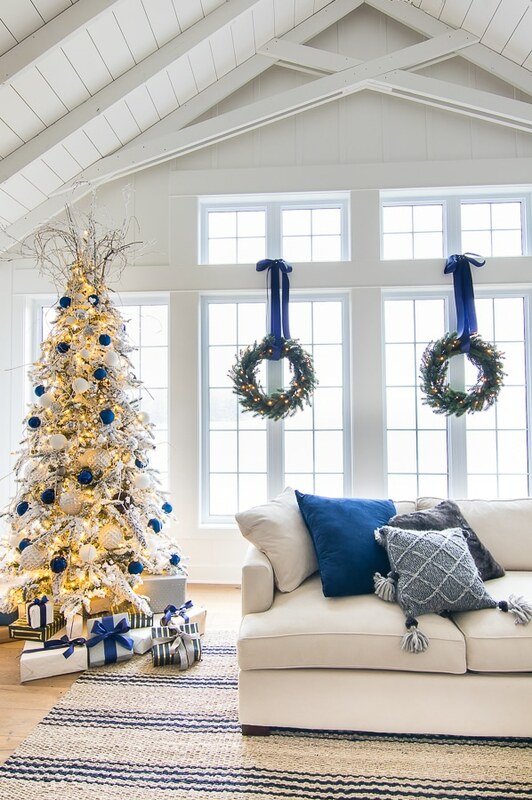 It was so fun to decorate with blue this year! This is so beautiful! 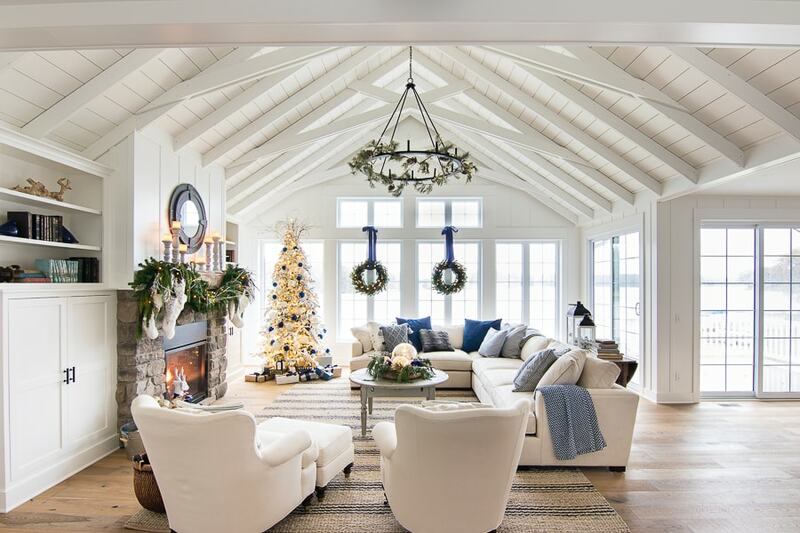 Where is the navy striped rug in the living room from? Dash and Albert, if you go to the shop my home page you will find it – thanks! Love the lighting over the dining table. Where is it from? If you go to the shop our house page you will find it – thanks!